A cabaret in New York City's Greenwich Village. Can you spot one of the world's great mathematicians in the crowd? Every first Sunday of a month at 5:45 PM, the Cornelia Street Café (in the Village, at 29 Cornelia St., between Bleecker and W. 4th Christopher St. is probably nearest subway stop; (212)-989-9319 ; see their website at www.corneliastreetcafe.com) presents a cabaret evening, Entertaining Science. What goes on? Well, science and entertainment Or… most anything and everything – readings, music, dialogues between people or with audience, pieces of theatre, magic, poetry, arguments on controversial issues – all having to do in one way or another with science… Definitely not in the formal setting of a lecture or a symposium, but in the company of friends and interested strangers, having fun. There will be a theme for each session, and several participants. As an example, in the “pilot” for this series we had a theme absolutely everyone can identify with, namely “Nothing.” K.C. Cole read from her recent book on physicists (and others) exploration of the vacuum, Oliver Sacks read from his “A Leg to Stand On,” and Roald Hoffmann read some poems about nothings and somethings. 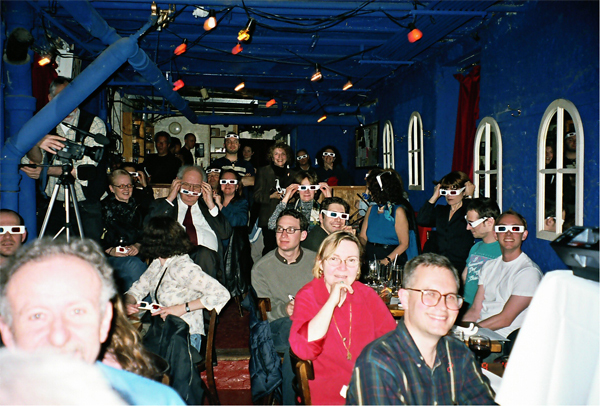 For the next show, look on the Cornelia Street Café website. Please send a message to rh34@cornell.edu asking to be added to a monthly mailing list. The programs are organized by Dave Sulzer and Roald Hoffmann. We are the hottest cheap ticket in town, so call cafe for reservations and come early. Admission is $15. See also The Squid's Ear. For a sister program on the west coast, see K.C. Cole's Categorically Not.